You can research all day long about the amount of time it should take to write a blog, how often you should be blogging, and the length your blog should be. But now it’s time to sit down and actually write your post. You’ve chosen your topic and you’re ready to put your information out there. But how do you know what elements to include in your blog to ensure it gets maximum exposure? While blogs can be written on a vast number of different topics, the good ones all have a few things in common. 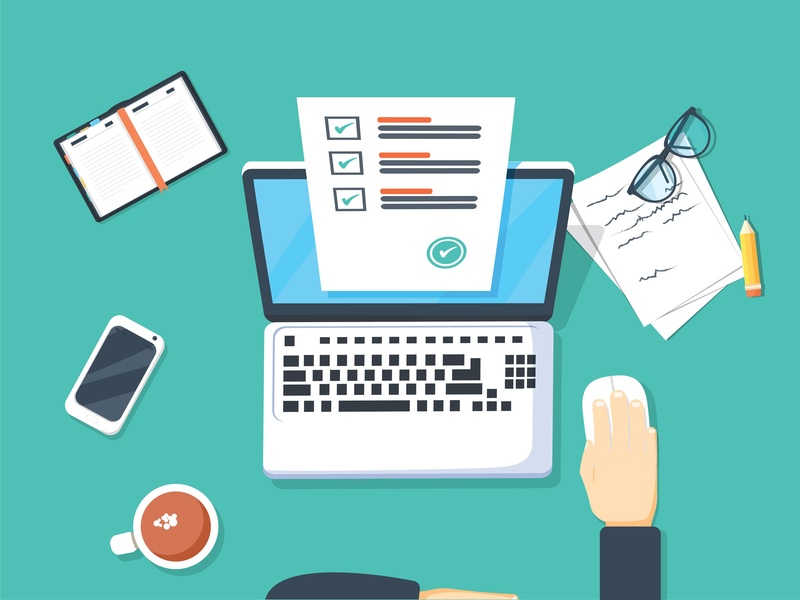 These items are the elements that turn a good blog article into a great one and encourage readers to subscribe to a company blog. How many times have you clicked on a blog article only to return to the search page because the article is difficult to read or the title was misleading? Details like these are what ensure your blog post is a great one. So, What are the Elements of a Good Blog? Relevant Picture: To begin, let’s start at the top of the page. A good blog should include a photo that is relevant to the subject of the blog. While it doesn’t have to be an exact match, the photo should generally relate to the overall theme you are writing about and generate some type of connection to visually reinforce your content. For example, we posted a blog to our site about the time it takes to write a blog. For the photo, we chose to use a photo of a clock with some coins by it, playing off of the saying “Time is Money.” While the photo isn’t someone writing an actual blog, it still is relevant because it includes the idea of time. Good Title: Next, ensure your title matches the subject of your blog. Think of yourself as a reader or put yourself in your buyer persona's shoes. If you were searching for this topic, would the title match what the blog has to say? *i5 Web Design Tip - If you are stuck while coming up with a title, try typing your subject into Google or another search engine. More often than not, the search engine will suggest a question similar to your subject. This is an added bonus because it means people are searching for that exact question. Author Information: People relate more to others if they can put a face to a name. Have anyone who is authoring blog posts create an author profile. Add a photo, link to social media, and write a small bio. Adding information about the author of the post allows people to feel as if they were reading a post from a friend, not an anonymous internet article. Newsletter Subscription: If you have a newsletter or blog subscription, place it on the sidebar of your blog. This should be easily accessible to any reader while they are on your blog. By making this visible and handy, you create a path of least resistance for readers to continue to engage with your blog and your content. Other Blog Categories: You should be tagging your blogs according to category. Don’t worry if you are just starting out - create categories based on the blogs you plan on writing in the future. Having all your posts categorized will make it easier for readers to continue to engage. If they find your topic interesting, they can click on a similar category and read more on the topic. Display these categories on the sidebar by the subscription option and past posts. Past Posts: In the same vein as blog categories, past posts should also be displayed on the sidebar of the blog. If a certain title stands out to readers as they are viewing your current blog, they can easily click on it and continue down your content path, possibly even ending up with a blog subscription at the end. Readability: This is an extremely important element to have in any blog. Breaking up your text is imperative to get readers to first skim and then further read your content. Add headers, numbered lists, bullet points, and photos. Break up large chunks of text into smaller paragraphs. Make your posts as easily digestible as possible for your reader. This will ensure that they continue to engage with your content instead of turning back and reading a different site. Internal and External Links: Links are essential to include in your blog posts because they are proof to search engines that what you have to say is important. By including both internal and external links on your site, you are giving your blog post force in the SEO world. Aside from SEO purposes, internal links allow your reader to continue further into your content journey. When our blog posts briefly mention a topic we’ve blogged about in the past, we link to that blog so people can delve deeper into that particular subject. External links are also important to provide proof for your statements. If you are citing a study or quoting numbers and facts, you can link to the site where you found your information. 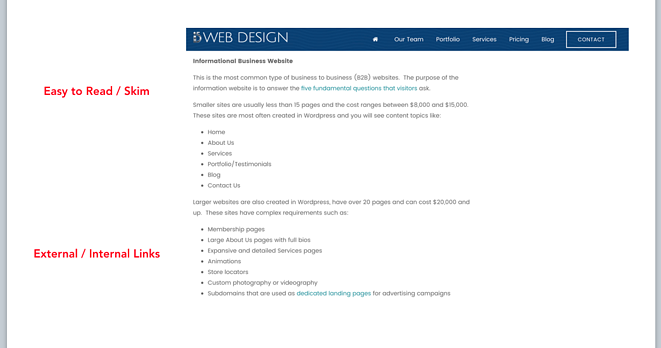 *i5 Web Design Tip - Be careful when linking to outside sources. Journals and studies are usually great external links, but try not to link to competitors or other blog posts that are similar to yours. You want to keep the reader engaged on your site, not push them to other sources. Call-to-Action: The final and arguably most important element of your blog should be your call-to-action. You have just provided your reader with valuable information. Use the momentum you’ve created to offer them even more information. Doing so will allow the reader to further engage with your business since they found your content valuable and would like more information. This information, however, should be gated by a form. This allows the already engaged reader to exchange their information for the valuable content you can offer. 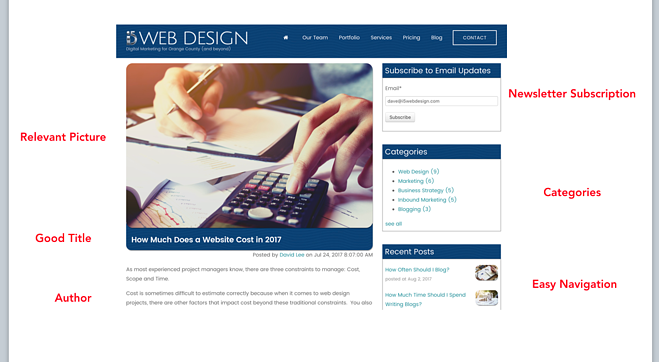 *i5 Web Design Tip - Make sure your call to action and offer are relevant to the blog topic. 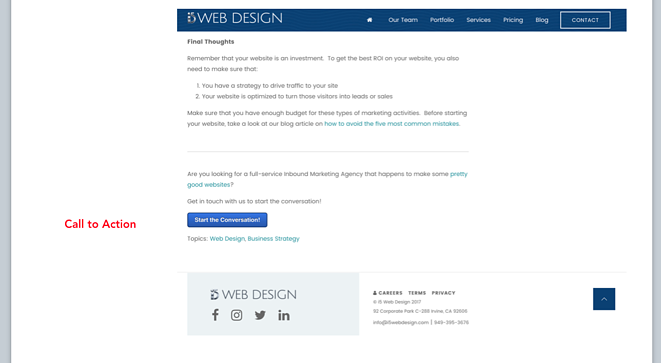 For example, if you are discussing websites as your blog topic, include an offer for a free website assessment instead of one for a marketing consultation. This will keep the relevancy and engagement intact instead of disrupting it with an irrelevant offer. Including all of the above elements in your post can turn your good blog article into a great one. The goal of any blog article is to provide valuable content to readers in a way that engages them and establishes yourself as an authority on your topics. By adding the elements of a good blog into your posts, you will draw the reader in and give them ample opportunity to not only engage with your content, but possibly turn into a lead or a customer down the line. Are you interested in learning more about blogging as a part of an overall inbound marketing strategy? We’d love to chat! Request a free Marketing Assessment to begin!